Teaching children how to be empathetic is a lesson often overlooked as parents. If your child lacks empathy and tact then this article will help in understanding empathy and how to teach it to kids. Empathy is a strongly needed quality among all people, young and old. With more empathy comes more compassion, lower crime rates, and less hate among everyone. Although empathy comes more naturally to certain people, it is something we should all strive for and it can certainly be taught. 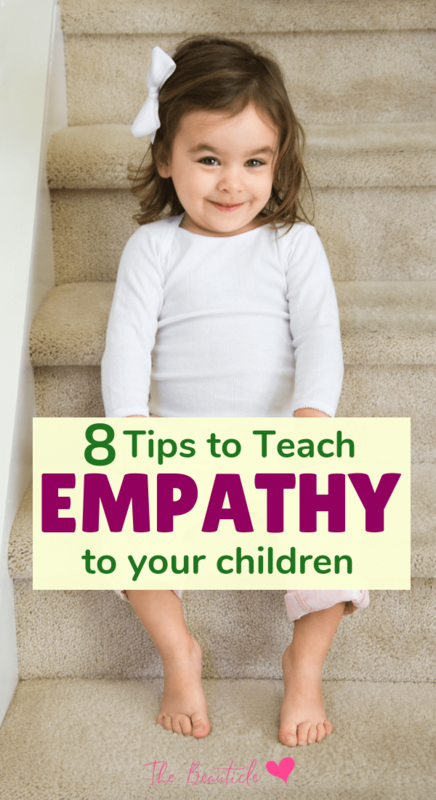 There are 4 ways we can help our children to grow empathetic. Here are a few ideas for assisting your child with their development of this very necessary trait: showing empathy. If you wish for your child to become strong in the area of empathy, you need to model this behaviour towards him (or her). Always be willing to see things from your child’s perspective, and try to identify with his feelings. If your child feels hurt about something you said, see the situation from his perspective. Apologize to him for your harsh or uncaring words, and mirror back in your words what he has told you. Help him understand that you see things from his point of view, as this is one of the best ways to show him what true empathy is all about. If someone has done something that made you feel upset, stop and think about their actions and your response instead of lashing out. Let your child see you showing empathy in action. Think about the other person and what may have caused their reaction, words or attitude towards you. Verbalize it with your child so they can see the thought process behind being intentionally empathetic. This will teach them the process so that they too can begin to use it in their own thinking. Talk to your children about the struggles that others go through. Show your concern, and ask your child if they have any ideas about how you could care for and assist those individuals. Stop any statements and feelings that show a judgemental attitude towards those in need, whether those needs are financial, physical, emotional or other. Explain how people can end up in various situations through factors that are beyond their control. This helps your child to see their own privilege, and to understand that we should all show compassion towards every person we meet, no matter what situation they are in at the moment. A great way to show empathy in action is to volunteer. Join forces with the rest of your family and put your energy to use by volunteering your time to those who need it the most. Serve meals together at a shelter, or put together care kits for the less fortunate. Become friends with those you serve, so that instead of seeing them as charity, your child is made aware that these are fellow humans with whom you have much in common. Holding empathy towards others is an important characteristic for our children who will someday run society. It is one of the greatest lessons anyone can learn. Develop this characteristic in your child to make a future that is better for us all. Tactfulness is the art of using discretion and sensitivity when speaking and relating to those around you. When teaching empathy, it is a great quality that helps one avoid awkward situations, and become a better friend to everyone. Children are born quite the opposite of this trait, but it is easier for them to understand as they grow older. If your child can learn to be tactful as a young person, it will save them from a lot of misunderstanding. Here is how you can help your child to become a tactful individual who is comfortable in their conversations both with friends and strangers. Our children need to know that honesty is important, and must be taught to tell the truth. Give them a foundation in what being honest is all about, and what it isn’t. Some people mistakenly believe that being honest means they can say whatever they want, whenever they want to. This is not true, and it can be hurtful and harmful to the people around them. Truthfulness and tact are excellent partners, as they balance each other. Talk to your child about how necessary tact is. Explain that when we fail to use tact, people’s feelings can be hurt, and the health of our relationships can be put at risk. Tell your child about situations where tact is essential and that it can be necessary for the safety of others. For example, in the relationships that world leaders hold with each other, tactful speech is crucial. There are also many others times where there is a necessity for using soft words rather than being completely blunt in a person’s speech. Talk to your children about situations where tact was not used. Discuss the consequences to the individual who did not use tact, and to the one who was on the receiving end. Explain that Aunt Sally probably felt bad when cousin Sam told her that her dress was ugly, and how cousin Sam may have then been viewed as an uncaring person. Talk about what could have been done differently in the situation and ask your child to give some more tactful responses. Point out situations where tact was used well, and the positive consequences that came from it. Speak about how a friend may have held off an argument through the use of tact and kind words, instead of letting all his anger out. Talk about any world leaders who are known for their peaceful acceptance of others, and how this trait has far-reaching positive effects. Point out all those people who excel in this area, and discuss what you can learn from each of them. Becoming a tactful person is a journey. Sometimes we hurt people with our words and we don’t even realize it. Make a point of helping your child grow in this area, and everyone your child comes in contact with will benefit from your effort.